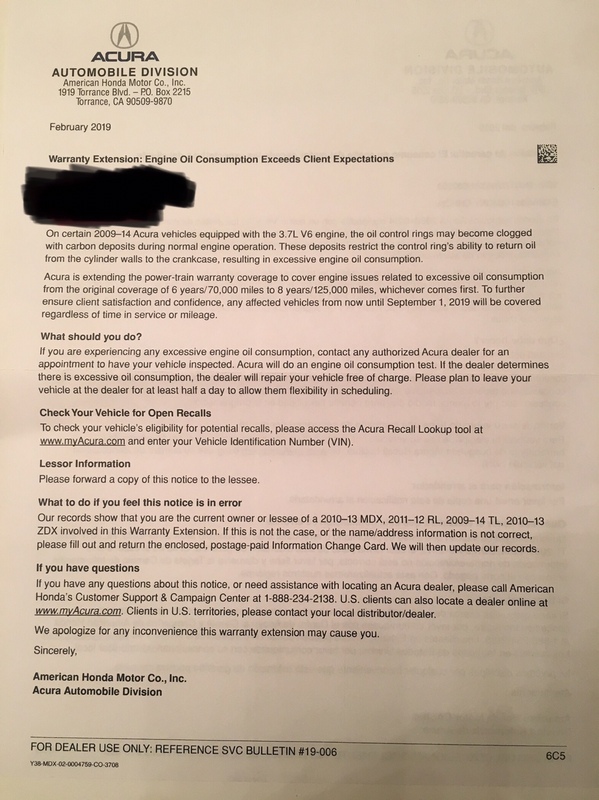 Acura MDX Forum : Acura MDX SUV Forums > Model Specific Discussions > Second Generation MDX (2007-2013) > Oil consumption letter from Acura..
Oil consumption letter from Acura..
Just said to get in touch with dealer to have it checked out, no parameters that I saw on oil consumption rates..
Can you take a photo of the letter? Did you see the recall letter on your Acura owner website? Interesting note in the first paragraph of the bulletin: Warranty claims submitted within 6 months of the client notification will be covered regardless of mileage or vehicle age. That could really be a big deal for some folks with higher mileage. I'm over 125k miles and not having oil consumption issues but it will be unfortunate if it happens down the road and out of warranty. So they're blaming it on clogged control rings...which makes me ask the question...did my running synthetic oil from the start keep me from having this problem? The MID on mine calls for oil changes around 8k miles which is no problem for synthetic (and my UOA proves this) however it could be a problem for conventional oil. At least enough of an issue that it could cause carbon build up in high temperature areas of the engine...such as the control rings. Wonder what constitutes excessive consumption? A quart every 1,000 miles? They will remedy it by changing the rings and pistons. What about the cylinder liners? I thought that was the cause of the oil issues in the 2010-2013 models. Seems to me that you could submit a claim, even if denied at this time, that may cover you for future oil consumption...someone above my pay grade is going to have to break down that wording. I would rather get rid of my X than let the yahoos at the dealership replace the pistons/rings. Seriously, what are the odds of the car ever being right after the dealership rips the engine apart? They have trouble getting brake jobs and oil changes right. Got the letter today. However, I may have solved the problem with using redline fuel system cleaner on every fill up (not full dosage, divide the bottle into 4). I'm sure I am going to fail the oil consumption test if they go by 1qt/1000mi. Using redline fuel system cleaner, all of sudden I could go 2000mi without a drop of oil usage. Interesting. We've had our mdx from new, we only do 6k miles per year. At 55k it started to burn oil. Had an oil change done 2 months ago, and had to top up twice already. Seems to burn 1qt every 500-750 miles. All of a sudden. Got the letter today also, might try the RedLine and see what happens. Id rather use redline and add a little oil if thats the only problem that pops up than have them rip the engine apart and find out that doesnt even fix the issue. Other than adding oil recently, have had 0 major problems. So its 1/4 of the bottle per fill up? Received the letter as well. What is considered oil consumption exceeds requirements? 1/2 quarts per 1000 miles or 1 quart per 1000 miles? Now the ball is in my court to decide what to do! Are you sure redline fix your issue? I cannot say for certain that Redline 100% fixed the oil consumption issue. Here is the timeline for last oil change. 1. Use Valvoline 5W-30 Maxlife Synthetic. I have been using this for a while so this did not solve oil burning issue. 2. Before the oil change, I poured 1/2 quart of Marvel Mystery Oil into the engine and ran it for about 300mi. I also used 6oz of MMO on every gas fillup about 4-5 times. It did seem to clean something, but oil loss was about the same rate. 3. So at about 1500mi, I top off 1/2 quart. I started using redline after this. At 2100mi, I top off another 1/2 quart. Then at 2700mi, the car loss a little over a quart...just below the minimum mark. I was shocked! 4. So I top off the oil to max mark, and continued using redline on every fill up. 5. The next 2000mi, the car did not consume a drop of oil. 6. The next 500mi, the car loss 1/2 quart. At this point, it is 5200mi into the oil change. The oil turning pitch black now. The oil loss here may contribute to volatile. Maxlife is 13% noack. 7. Top off 1/2 quart and keep monitoring. I might change oil this weekend if temperature reaches +38F.